I must admit, when it comes to skies… I’m not above cheating. In this tutorial, I’ll show you a technique from my book Understanding Adobe Photoshop CS5. Be sure to also click here to download the hands on-practice files. The book contains hundreds of hands on files and hours of training videos. Here’s a sample. A professional photographer can spend a good part of a day waiting for the perfect sky and weather conditions. You, however, may not be as lucky (or patient). Skies will often be washed out and appear missing due to overexposure. One solution is to take pictures of the sky when it looks its best. I have found the desert or the ocean to be the best place to shoot the sky. This is often because the amount of environmental and light pollution is greatly reduced. Don’t worry if this isn’t an option for you, just keep your eyes out for a great day with beautiful skies and remember to shoot some still plates for your collection. These can then be combined with your landscape photos to create new composite images. 1. Open the file Fix_Sky.tif from the download. 2. Use the Color Range command (Select > Color Range) to choose the sky region. 3. Subtract any stray selections in the lower half of the photo by using the Lasso tool and holding down the Option (Alt) key. Alternatively, switch to Quick Mask mode for more detailed touch-up of the selection. Or try the Refine Edge button in the toolbar. 4. Double-click the Background layer to float it. Name the layer Boat and click OK.
5. Invert the selection by choosing Select > Inverse or by pressing Shift+Command+I (Shift+Ctrl+I). 6. Click the Add layer mask button to mask the sky area. 7. Choose File > Place and select the file New_Sky.jpg from the downloads folder. Press Return (Enter) to apply the placed photo. 8. Drag the sky photo behind your masked image. Use the Free Transform command (Cmd+T or Ctrl+T) to scale and position the clouds. There will likely be fringe on the edges that will need touching up. 9. Select the Layer Mask thumbnail and adjust the Feather slider in the Masks panel. 10. Click the Mask Edge button and refine the mask as desired. 11. Touch up any problem areas on the Layer Mask. Use the Smudge tool set to Darken mode to touch up the area around the trees on the right of the frame. You can also touch up the Layer Mask by using a paintbrush and black set to 20% Opacity. Brush over areas that need to be blended. 12. Blur the sky slightly so it better matches the depth of field in the image. Use the trees for guidance. You can use the Gaussian blur filter (Filter > Blur > Gaussian Blur) set to a value of 4–6 pixels. 13. To make the colors match better, you can place a second copy of the sky on top. Be sure just the blue sky is covering the photo. Set the blending mode to Overlay or Soft Light and lower the Opacity of the layer. The completed image, Fix_Sky_Completed.tif, is in the downloads folder if you’d like to examine it more closely. 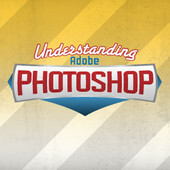 Here’s a how-to video, one of 65 that’s included with the book, Understanding Adobe Photoshop CS5.